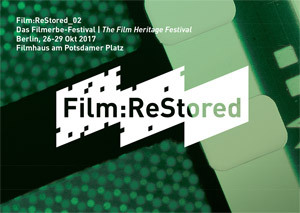 FIAF is proud to announce its association with the second edition of Film:ReStored, the Film Heritage Festival organized and hosted by the Deutsche Kinemathek. The festival will take place at the Filmhaus am Potsdamer Platz, Berlin, from 26-29 October 2017. With Digitally restored films by Harun Farocki, Rainer Werner Fassbinder, Michael Klier, Wim Wenders and others. Lectures by Michal Bregant, Martin Koerber and others. Workshop presentations by Serge Bromberg, Wim Wenders, Anke Wilkening and others. The complete programme is available below and can be downloaded HERE. OSTKREUZ (DE, 1991, directed by Michael Klier), DCP, 85 Min. ALICE IN DEN STÄDTEN (ALICE IN THE CITIES, FRG, 1974, directed by Wim Wenders), DCP, 112 Min. Ulf Drechsel and Gudy Fichelscher play a set! The journalist talks to Tobby’s wife about jazz, with tracks from the 1960s.